9ct yellow gold ring featuring central sapphire stone surrounded by diamond clusters set in 9ct white gold. A classic design featuring a total of 0.18 carat diamonds. 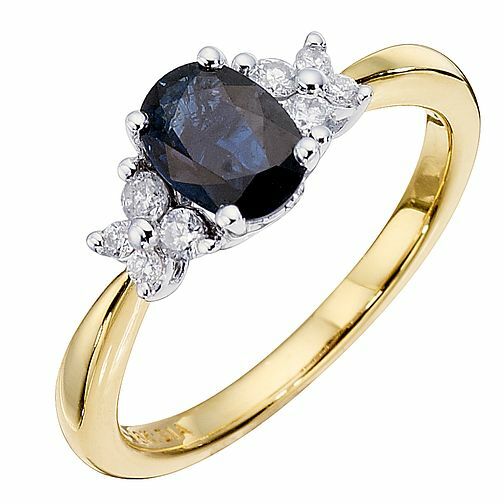 9ct Yellow Gold Sapphire & Diamond Ring is rated 5.0 out of 5 by 8. Rated 5 out of 5 by Anonymous from Perfect Engagement Ring! Finding a ring with a dark stone in red or yellow gold was an absolute pain and this fit the bill perfectly! Rated 5 out of 5 by Anonymous from super ring realy lovely ring well designed, wife loved it, was for our 45th wedding anniversary, would recommed.